Mark your calendar. Mayhem is coming September 13. Worldwide Gameplay Reveal on May 1. In case you missed it, Borderlands 3 was officially announced during the Gearbox Main Theater Show at PAX in Boston last week. Gearbox CEO Randy Pitchford and other members of the Gearbox team were on hand to share a bunch of Borderlands-related news with attendees and online viewers, and the session ended on a high note with the first ever showing of the Borderlands 3 developer trailer. A full week’s worth of excited speculation about planets other than Pandora, the availability of new vehicles, and guns with legs later, we’ve updated borderlands.com with a bunch of Borderlands 3 info and dropped a new trailer that you can check out below. 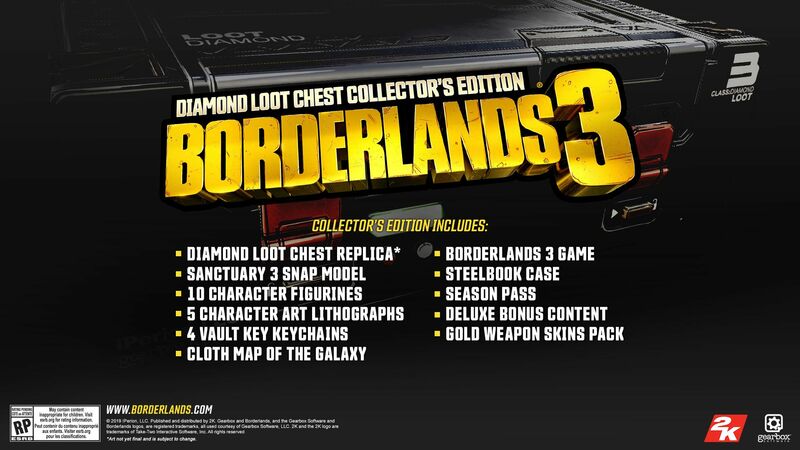 Like previous Borderlands games, Borderlands 3 casts you in the role of a Vault Hunter—a treasure-seeking badass with access to powerful abilities that violently complement the game’s seemingly never-ending arsenal of apocaliscious weapons. The Borderlands are under threat; the fanatical Calypso Twins are uniting the bandit clans and attempting to claim the galaxy’s ultimate power, and only you can stop them. Each of the four all-new Vault Hunters featured in today’s trailer brings different abilities and playstyles to the party and is more than capable of tackling the Twins and their followers alone if you choose to play solo. But true to the Borderlands DNA, the game can also be enjoyed cooperatively by up to four players. Teaming up with other Vault Hunters is easier than ever in Borderlands 3 because you can play alongside friends regardless of your respective character levels and mission progress. When you play together in the default co-op mode, everyone in the group will deal meaningful damage to enemies and, more importantly, will receive level-appropriate rewards when looting those enemies’ corpses. Your Borderlands 3 adventure will get underway where it all began on Pandora, the post-apocalyptic wasteland where Borderlands and Borderlands 2 took place—but you’ll also travel to other planets within the Borderlands galaxy in search of Vaults and loot. Some of those planets can be seen in today’s trailer if you watch closely, as can some of the new enemies that inhabit them. If you’re planning on doing some sightseeing, you’re going to have to deal with the locals first. 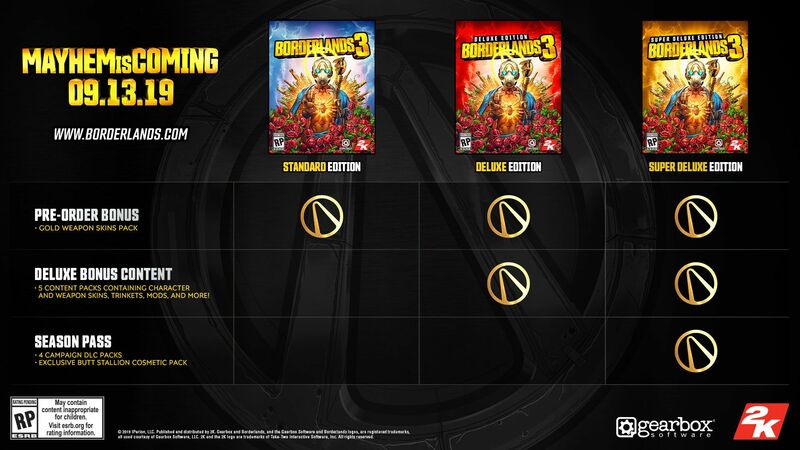 Multiple editions of Borderlands 3 are scheduled for release on PC, PlayStation 4, and Xbox One on September 13 and are available to pre-order now. We’re excited to share more details on the game with you during our gameplay reveal event, which you can watch live here at borderlands.com starting at 10am PDT / 1pm EDT / 6pm BST on May 1 or 1am GMT+8 / 3am AEST on May 2. Please note that there may be differences in Collector’s Edition content and availability depending on your location. If you are outside of the Americas, please check with your local retailer for more information.